July 14, 2017 Blog	Leave a comment. A trampoline is a fun experience and whether an adult or a child the using a trampoline is a fascinating and fun sport. Every year children and adults find themselves in the hospital from injuries they get playing on a trampoline. This usually happens because they fail to follow trampoline safety tips and they are being careless. Here are some Dos and Don’ts injury prevention tips that are a must if you want to enjoy your trampoline safely. A Safety net greatly aids trampoline safety. These nets surround trampolines that are usually suspended above the ground and prevent jumpers from going over the side. Their construction helps to keep the person jumping toward the center of the trampoline and thus prevents injury from a fall. It is not meant to be a replacement for a spotter, but will help to keep the active jumper much safer than without the net. A better option if available is to build the trampoline as close to the ground as possible. They should have holes that are tiny enough to not let little fingers through but still have enough visibility to see through them. They should be able to withstand numerous impacts by heavy people. A good warranty is essential as this is often an excellent indicator of durability. Make sure to always have adult supervision or a spotter. 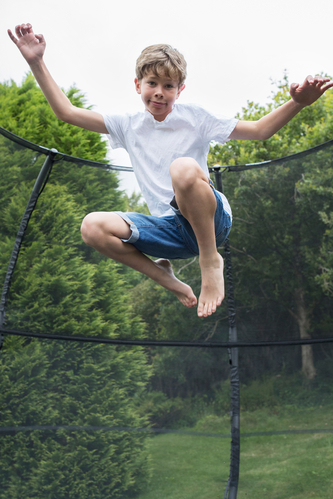 Whether the trampoline is being used by a child or an adult, the trampoline should not be used when alone even if the user is an experienced gymnast. It is the number one safety rule even in gymnastics to always have a spotter present when using a trampoline. As adults, the best thing they can do apart from educating the jumpers on the proper safety standard, is to set an example by always following the rules themselves. As others are often prone to imitate other examples they see and it often ends in a disastrous result. Do not allow more than one person at a time to jump on the jumping surface as the chances of accidents are higher due to the unpredictability of how the jumpers move there is a higher chance of collision, loss of balance etc. which increases the risk of injury. Make sure never to dismount from a trampoline when jumping as the risk of landing too hard or landing in the wrong angle etc. is very high and people often get very injured when dismounting that way. Do not jump from a very high structure like a roof or any other higher surface onto the trampoline. Never attempt a midair somersault or flips unless are skilled enough to do these moves, and even if skilled always ask for assistance from a trampoline coach and make sure to have a controlled environment. Never use the trampoline when under the influence of drugs or alcohol or any other such products that affect the acuity of senses. Trampolines are generally constructed with the springs attaching the trampoline to its frame. These springs and the gaps between the trampoline and its frame can harm if the jumper falls close to the edge. The springs especially can pinch on things and people and it is very difficult to remove anything stuck in the spring, so to minimize the possibility of injury make sure to use trampoline safety pads that cover this entire surface. The Features to look for when selecting a trampoline and safety pads are given below. Almost all good trampolines always come with safety pads, if they don’t it is necessary to always make sure to buy a good quality of safety pads. Trampoline Safety Rating – Many trampolines get their trampolines tested by the ASTM to ensure that the trampolines meet the safety standard for the standard user. It is recommended to always choose trampolines that are tested and certified as per ASTM standards to make sure that the best and safest trampolines are bought. Now that you know how to safely enjoy these great toys check out the best models here https://trampolinereviewsite.com.